Religion is an essential aspect of life in Myanmar and central to conceptions of personal identity. Most of the Burmese population identify as Buddhist (87.9%). However, there are also significant minorities of Christians (6.2%) and Muslims (4.3%), as well as some Animists (0.8%) and Hindus (0.5%). Generally speaking, one’s religious identity is related to ethnic origins. Most Bamar are Buddhist while people belonging to minority religions are usually from minority ethnic groups. Christianity is dominant among the Kachin, Chin and Naga ethnic groups. It is also practised widely among the Karen and Karenni ethnic groups, although many Karen and Karenni are Buddhist and some Karen are Animist or Muslim. Islam is widely practised among ethnic Indians, the Kaman and Rohingya as well as some Bamar. Religion has become a source of deep friction in Myanmar. Buddhism is integrally linked to the idea of the Burmese nationality. This Burmese Buddhist nationalism became highly politicised in the early 20th century for the role it played in the independence movement against the British. Meanwhile, Christianity was seen as a British establishment. The role of religion in the rise of nationalism was also heightened by the ethnic differentiations between core followings (most Buddhists being Bamar whilst Christians and Muslims are generally from minority ethnic groups). Religious minority populations experienced arrest and detention, restrictions on religious practice and various forms of discrimination. At times, the military sought to widen divides for political purposes by inciting violence. For example, they were known to dress up as monks and torch Islamic and Christian places of worship. While religious persecution is perceived to have been reduced since the election of Aung San Suu Kyi and her party, this is only true for some groups. Currently, intolerance towards a small Muslim minority – the Rohingya – is especially violent and inhumane. Rohingya Muslims are subjected to physical abuse, torture, extrajudicial killing, summary execution, arbitrary arrest and detention. Government policy restricts their religious practice, marriage, travel and access to education, and prevents their employment in the social services. The Rohingyas are also denied citizenship, meaning anti-discrimination laws do not apply to them. Some radical Buddhist leaders openly promote hostility towards them. See ‘Political Situation’ under Core Concepts for more on this. Buddhism is deeply embedded in Burmese culture and has become associated with the national identity of the Bamar. The prominent form of Buddhism practised in Myanmar is Theravāda Buddhism. Followers of Theravāda Buddhism take refuge in the ‘Triple Gem’: the teacher (Buddha), the teaching (dharma) and the monastic community (the Sangha). These three elements of Buddhism provide a sense of stability within Burmese society by offering a structure for people to base their everyday routines around. The Sangha (the Buddhist monastic order that includes ordained monks, nuns and/or novices) is an important institution in Myanmar. Monks, nuns and other lay spiritual leaders hold great status and respect within their communities. It is commonly expected that males will enter the monastery twice in their lives as a rite of passage – the novitiation ceremony (shinpyu). This happens for a period of time as a child and again as an adult. The education as a novice can last for a few months, if not several years. In Myanmar (and Theravāda Buddhism more generally), the Buddha is not considered a ‘God’ as understood in the Christian sense of the term. Devotion towards the Buddha is more similar to the respect a student has for a teacher. Reverence to the Buddha is accompanied with his core teaching (dharma) known as the ‘Four Noble Truths’, which dictates that underpinning all existence is suffering and one can reach liberation through practising the ‘Eightfold Path’. The practice of Theravāda Buddhism is unique in Myanmar for it incorporates spirit (nat) worship. See the section on Animist beliefs below for more information on this. 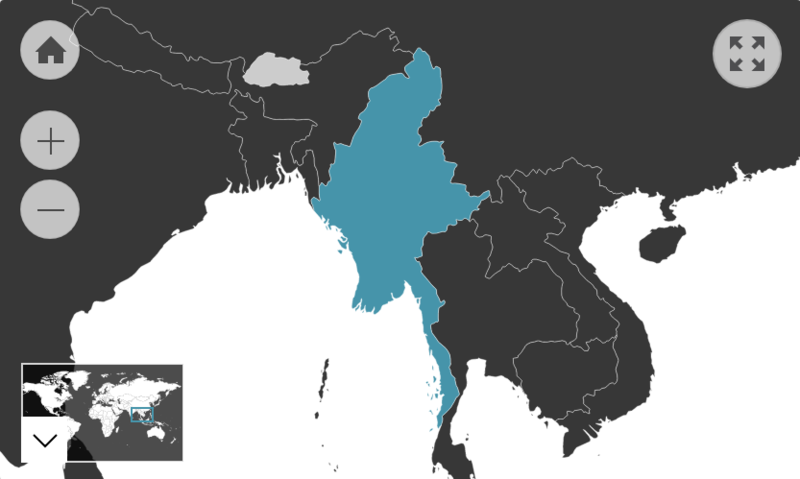 Christianity is the second largest religion in Myanmar. Its followers mostly belong to indigenous ethnic minorities that converted through European missionary work in their regions. The biggest traditions are Roman Catholicism and Protestantism. The Burmese approach to Christianity generally puts an emphasis on Bible study and prayer services (hymn singing). There is also a widespread practice of fasting on Martyrs’ Day. Christian ideas are often intermingled with the traditional beliefs of indigenous ethnicities. For example, some people may have tattooed skin for magical protection. Though the majority of the indigenous ethnicities of Myanmar have converted to Buddhism, Christianity or Islam, people often incorporate animist beliefs into their understanding of organised religion, health practices and daily life. Most of these traditional beliefs involve spirit worship. For example, Buddhists tend to believe that nats (spirits) dwell in natural objects or phenomena such as rivers. There are nat shrines across the country where people can make offerings for protection or success. Many Karen similarly believe that the benefits of spirits can be found through rituals – such as guardian spirits (ther myng khae). Historically, most nat kădaws (spirit mediums) were women. However, today most are gay men and many are either transgendered or transvestites. Many Karen and Karenni believe that a person possesses a number of souls called ‘kla’ which might flee for various reasons (e.g. in connection with a mental breakdown). It is seen as vitally important to retain the kla and losing kla puts a person in danger of illness. People may try and retain the kla by tying a sacred string around someone’s wrist. Some Karen people also believe in an omnipresent unknown total force called ‘pgho’ and non-Christian Chins may believe in ‘hnam’, an evil spirit that dwells within humans. Some people may carry elephant tail hairs to ward off evil.